These creatures are made by implanting mice with human tissues taken from late-term aborted babies. The HHS’s multi-million-dollar contract with UCSF that requires the construction of these “humanized mice” creates a demand–driven by federal tax dollars–for tissue taken from late-term aborted babies. According to an estimate it has published on its website, the National Institutes of Health (which is a division of HHS) will spend $95 million this fiscal year alone on research that–like UCSF’s “humanized mouse” contract–uses human fetal tissue. 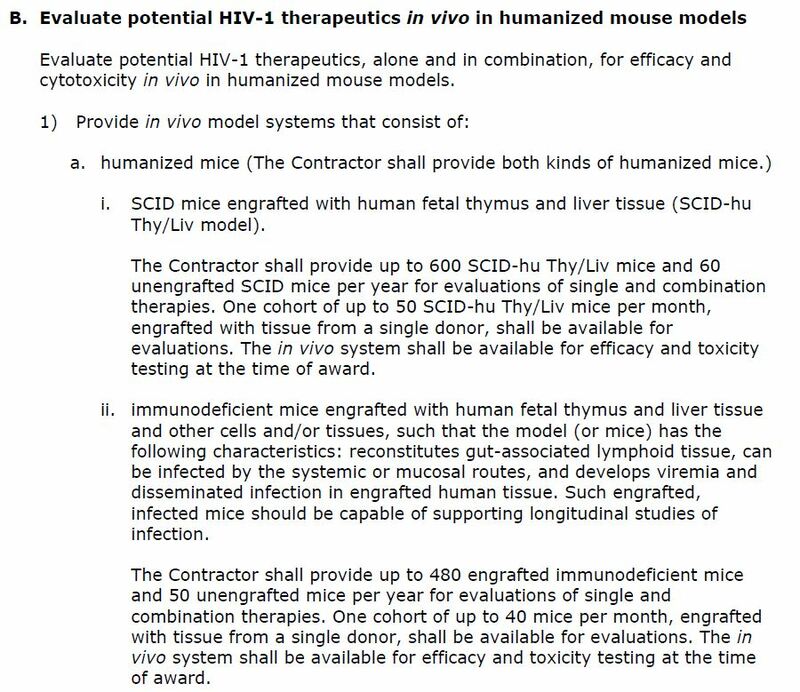 Under the new 90-day extension, the contract—which the government calls “Humanized Mouse Models for HIV Therapeutics Development”–will run through June 5. “The UCSF contract has been issued another extension,” HHS said on Friday in response to questions from CNSNews.com about the contract and the review. “We will provide an update on the review once it has concluded and as appropriate,” HHS said. As CNSNews.com first reported on Oct. 17, 2018, the National Institutes of Health, which is part of HHS, originally signed its “humanized mouse” contract with UCSF on Dec. 6, 2013. The contract was for a one-year period and gave the government the option of renewing it for up to six additional one-year periods through Dec. 5, 2020. According to contract information published on the Federal Procurement Data System, the new three-month extension will pay UCSF $521,082—bringing the total payments the federal government has made to UCSF for this contract to $10,596,960. If the government continues renewing the contract through Dec. 5, 2020, HHS would end up paying UCSF a total of $13,799,501. The “Statement of Work” in the original contract solicitation said that the contractor would be required to make one “cohort” of “up to 50” mice per month of the first type of humanized mouse and another cohort of “up to 40” mice per month of the second type. The statement said each of these two cohorts of “humanized mice” should be made “with tissue from a single donor”—meaning a single aborted baby. An article published in the Jan. 12, 2016 issue of Stem Cell Reports, which discussed research funded by the contract, described humanized mice that were created by engrafting them with human fetal bone marrow, liver and thymus taken from babies who were 20-to-24 weeks in gestational age. Another article discussing research under the contract was published in the Feb. 27, 2017 issue of Pathogens. This article described another type of humanized mouse that was engrafted with “fetal gut tissues” taken from babies at 18-to-24 weeks in gestational age. On Dec. 4, 2018, one day before the contract’s most recent one-year extension was set to expire, HHS gave UCSF an initial 90-day extension on the contract—rather than a full one-year extension. That 90-day extension was set to expire on March 5. But with the new 90-day extension signed on Feb. 19, the contract is now set to run through June 5. On Dec. 5, 2018, HHS published a statement in response to a story that the Washington Post published about the UCSF contract that cited an unnamed “virologist” and an unnamed “university spokeswoman” in reporting that the NIH had informed the contract’s principal investigator that the government was ending the contract. “According to the virologist, the principal investigator was told in a telephone conversation with an NIH employee last Wednesday that the AIDS division was exercising its discretion to discontinue the contract,” the Post reported then. “A university spokeswoman, speaking on condition of anonymity because she had no authorization to discuss the matter, confirmed the university was informed last week the contract was not being extended,” the Post said. But HHS refuted this story. “No decision has been made on the extension of a University of California San Francisco contract with the NIH regarding research involving fetal tissue,” HHS said in a Dec. 5 statement responding to the Post’s report. “A decision will be made when the contract has been reviewed, pursuant to the ongoing audit/review process,” the HHS statement said. On Jan. 10, CNSNews.com published a story about the initial 90-day extension that HHS had granted UCSF’s humanized mouse contract on Dec. 5. “The contract remains on the 90-day extension to ensure continuity of service until the audit is completed and a final decision can be made about the contract,” the NIH said in response to questions from CNSNews.com at that time. The use of aborted baby body parts and stems cells has sparked anger among anti-abortion groups in the United States and it has been dubbed “Frankenstein” science. And shocking undercover footage has led to the Donald Trump administration to reassess if the practice should be continued at all. But what is known is that abortion clinics are supplying the fetal body parts, although they are not allowed to sell them. Phelim McAleer, who has produced the film Gosnell, about a rogue abortionist, told Fox News: “Aborted babies bodies are a very valuable commodity in today’s America. Jihadist factions including Syria’s former Al-Qaeda branch have pulled heavy weapons from parts of a planned buffer zone in the country’s northwest put forward under a Turkey-Russia deal, a monitor said Monday. Hayat Tahrir al-Sham “and other less influential jihadist groups have withdrawn their heavy weapons from large areas of the demilitarised zone” ringing Idlib province, said Rami Abdel Rahman, head of the Syrian Observatory for Human Rights. HTS has yet to comment on the reported withdrawal, which quietly began “two days ago”, according to Abdel Rahman. 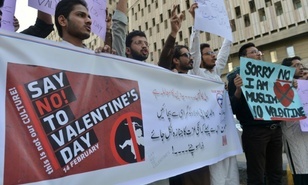 A Pakistani court has banned public celebrations of Valentine’s Day in the capital Islamabad while Indonesian students plan to spurn the event, as the festival of love gets a chilly reception in parts of Asia. Lonely hearts looking for romance in Australia, Malaysia and Singapore were warned to beware of the growth in online love scams, while grumpy protesters in Japan rallied in recent days for an end to public smooching. Monday’s decision by the Islamabad high court was the latest attempt by authorities in the conservative Muslim country to outlaw a celebration seen by many as a vulgar and indecent Western import.